This was our third stay at this wonderful location. Catriona was,as usual, very helpful in every way.. Nothing was too much trouble and we will be returning in the future. Thank you once again Catriona for a lovely stay. The accomodation was clean, spacious and well appointed. The location was ideal for access to the loch and also the low hills alongside the property. The owners provided very detailed directions and information regarding the local area. I would highly recommend the property and would certainly book again. We received a warm and cheerful welcome from our caring and considerate hosts at Blarghour Farm. 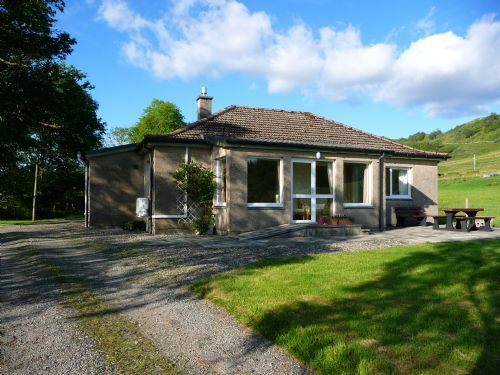 Barr Beithe cottage was immaculate, extremely comfortable,peaceful and well equipped, and was set in a fantastic position with superb uninterrupted views down Loch Awe. Wildlife came right up to our door and gave us some thrilling views from our chairs in the sunroom. We found it difficult to pull ourselves away from this delightful cottage, with its gorgeous waterfall and fabulous views, but the nearby surrounding areas were worth a visit. Using Barr Beithe as our perfect base we found Kilmartin Glen less than an hour away,steeped in history with 5000 yr old burial chambers, standing stones, plus an award winning museum and cafe. Oban,the gateway to Island hopping was just over an hour away, and for spectacular grandeur, Glen Coe's scenery was hard to beat. With so much more yet to discover in this enchanting area, such a perfect cottage to stay in, and a warm welcome ensured, it is no wonder that we have already booked into Blarghour Farm for next year! If you’re looking for a place in nature, close to a loch and to relax, it’s the place to go. We loved it! Fantastic cottage everything you need in excellent condition and if you want beautiful views, friendly owner, and quiet (apart from the waterfall) it’s place for you. Beautiful location and relaxing holiday. We spent a lovely week at the cottage exploring the local areas. We enjoyed the glorious walks around the Loch and explored various islands including Luing and Ghia where our highlight was watching some sea otters playing in the sea. The cottage was everything that we expect and enjoyed returning to it in the evening. We will return again at another time of the year. We had a smashing time during our stay at Barr-beithe lower. The cottage had fantastic views over the loch. It was clean. Had a lovely gas fire in the sitting room. Beds and seating were comfortable. Every evening deer came into the fields and we would sit in the sunroom watching them. Magical! We also saw oyster catchers down by the loch, mallards and golden eye. We went out in the car most days to explore. Glen Coe was probably my favourite trip but also went to Oban and took the ferry over to Mull for the day. Went round Inveraray castle and along the Kintyre peninsula. When we got back we tended to walk along the road or explore up into the hills. Catriona called in on our first evening and was happy to answer all our questions and gave us some handy tips on where to go. All in all an excellent holiday. Will be back as we have lots more to see. Our stay here was wonderful. The house more than satisfied us. It was warm, clean and well furnished, especially kitchen equipment. Our hosts were very kind and helpful at a difficult time (Beast from the east arrived whilst there). The surrounding environment was good for walking with lovely varied scenery. Single track road was daunting but manageable. We had a wonderful stay. The cottage was perfect and very peaceful. The children loved playing at the loch side and spent hours pottering away. Beautiful scenery. We ordered our Tesco shopping for the Sunday which was great. Catriona was kind and helpful. We wanted a break away from it all and got that exactly! 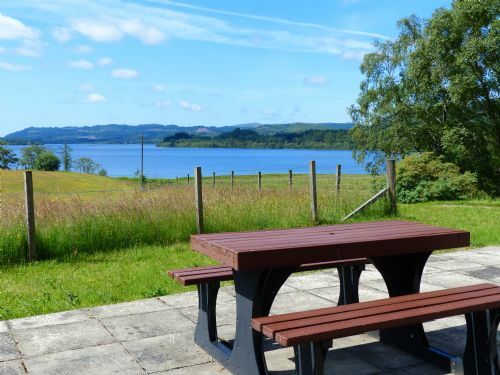 On the whole an ideal location with excellent facilities and a very peaceful and picturesque direct view onto Loch Awe. We had a lovely stay in a very relaxing & peaceful location with the chance to spot plenty of wildlife from the front sun room of the bungalow. The house was ideal for 4 of us & is in a good location to fully explore the area. There is plenty to do & see, a week wasn't long enough to fit it all in. However, A week here ensured a fully relaxing & stress free stay & we were sorry to leave. An ideal spot for those who love to get away from it all & enjoy spectacular scenery. Definitely worth a stay. Our stay here was great. The house had plenty of space, comfortable furniture, and all the pots, pans, etc we needed to cook. 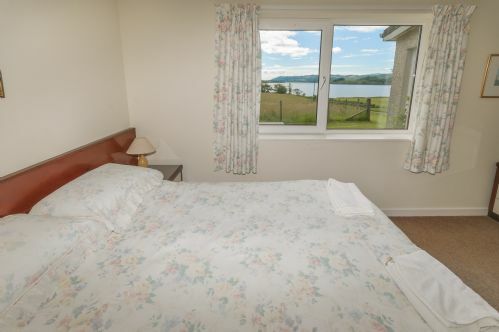 The view from the sunroom is beautiful, overlooking the loch and the hills beyond. We did a lot of walking around the farm and enjoyed the hills, woods and waterfalls. The location was good for day trips to see the Nether Largie standing stones, Inverary, Kilchurn Castle and Oban. The cake box at the end of the road became a daily stop. My 4 year old loved the house and climbing the hills on the farm as well. The only thing we didn't love was the long trek down a one lane road to get there - that was quite an experience for our first time driving in the UK, but we'll worth it. Thanks for having us stay! Catriona made us feel so welcome when we arrived. The view was amazing. The cottage was so comfortable and was really well equipped. We very much enjoyed our time there. We had an excellent week, the cottage is well appointed and the location is terrific. On arrival we enjoyed some superb home-made shortbread with a cup of tea. 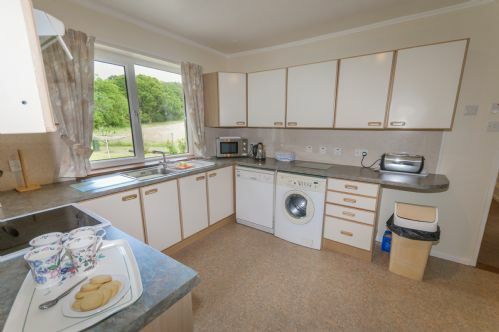 All the rooms were clean and tidy, the kitchen is well equipped and the sun-room with a view over the loch is a delight. The owner was very courteous, helpful and not intrusive, clearly loves the Loch and it's wildlife. As a base for a fishing, nature, walking holiday or simply somewhere quiet to escape to this is an ideal choice. This was our 5th visit to this property and it is the ideal place to chill out for a week away from the hassles of civilisation. With great views of Loch Awe from the front of the house and plenty of activities and walks around the area we are never bored. Even in bad weather we just sit in the comfortable lounge reading or just relaxing. We have had a fabulous holiday. On our second day we were sitting in the sunroom, taking in the wonderful view of the loch and spotted an osprey feeding in the bay!! We visited Oban distillery and sampled their whiskey. Took the ferry over to Mull did a wild life tour to see the White Tailed Eagles. Walked up Ben Cruachan, a Munro at the top of Loch Awe. That was pretty tough but were rewarded with great views with good visibility. The cottage was cleaned to a high standard and very comfortable. It provided a good base for our holiday. We will definitely be back as there is so much more we want to see. Many thanks Catriona for your insight on the area and the fabulous shortbread that was waiting for us on arrival. The best I have ever tasted! We found Barr-beithe lower to be clean and well appointed with everything we needed. When we arrived there was a cup of tea with homemade shortbread laid out for us. Our host, Catriona, was happy to chat about the area and pass on useful information. We used the cottage as a base for exploring and saw some lovely scenery and places. There were plenty of things to do on day trips. 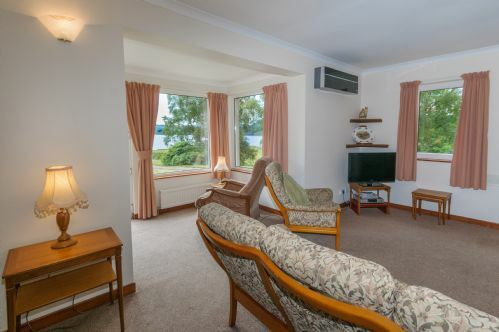 The cottage has a cosy seating area off the sitting room where you can sit and take in the splendid view of the loch. We were very content sitting there. We will definitely stay in this cottage again. We had a lovely stay in Barr-beithe Lower and enjoyed the winter sunsets over Loch Awe. The cottage itself was spotless and ideal for a family. We enjoyed walking in the hills on sunny days and skimming stones from the Loch shore. The sunroom looks over a field and enjoys a long view down Loch Awe, and the loch is magical in the way reflects the sky above. Plenty of room for children and adults alike. Catriona emailed good directions and helped us orientate ourselves after we arrived. Lovely drives to Oban, Inveraray, Crinan Canal and the standing stones along Kilmartin Glen, and don't miss Glen Coe. A memorable family holiday and one we are happy to recommend.